Dressing the eggplant strips while they’re still warm allows them to absorb the maximum amount of flavour. Preheat barbecue hotplate to medium-high or preheat oven to 180°C. Cut eggplants lengthways into 2cm-thick slices. Set aside ½ the oil. Brush a little of the remaining oil on each side of each slice. 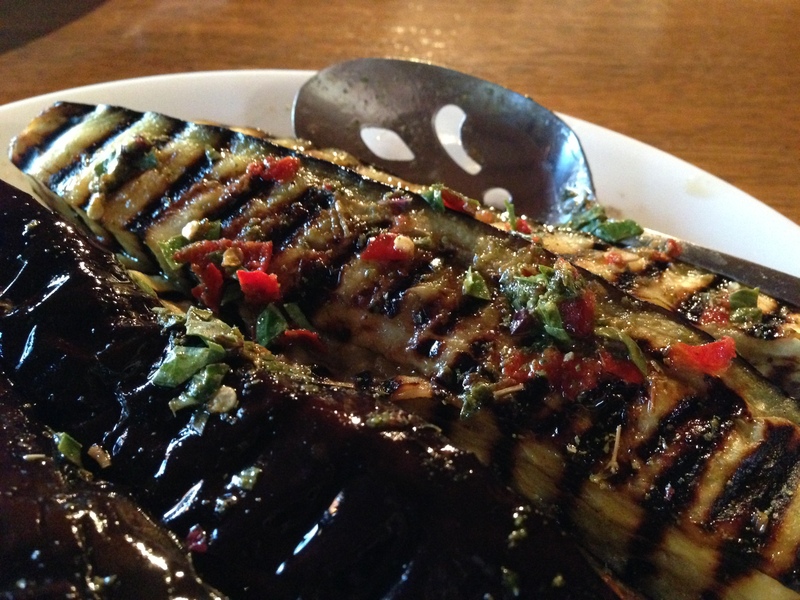 Add eggplant to hotplate and cook on each side for 5-7 minutes or until charred. Or, if using oven, put eggplant on an oven tray and cook for 15-20 minutes or until soft. Meanwhile, use a large mortar and pestle to grind chillies, salt and garlic until combined. Add oregano and grind until a rough green paste forms. Stir in vinegar and reserved oil. Cut each eggplant slice lengthways into 3 strips. Put in a large bowl, pour over dressing while eggplant is still hot and gently stir to coat. Serve immediately.